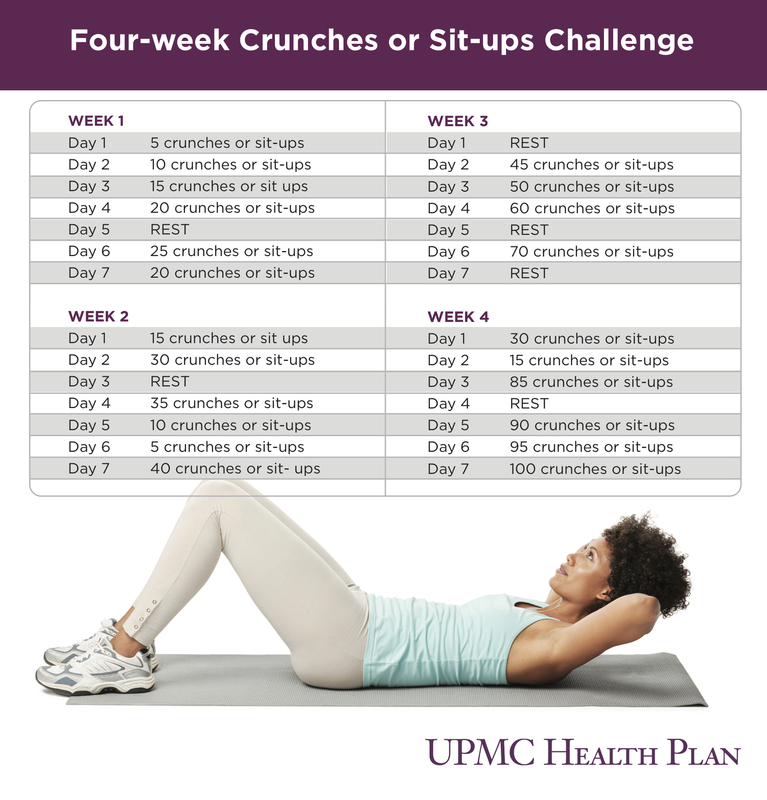 Crunches (or sit-ups) are a great exercise for anyone! Best of all, you don’t have to lug around fancy equipment. 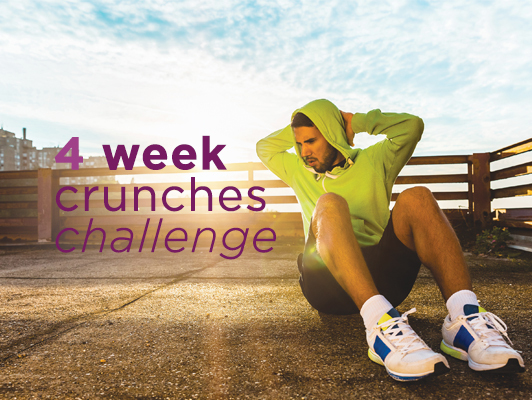 This four-week fitness challenge will help you build a strong core — which can improve things like posture, balance, and even low back pain. Better still, crunches and sit-ups can be done anywhere! As you get stronger you can move from crunches to sit-ups. Check out our step-by-step guide for both exercises below! To start, lie on your back with your knees bent and feet flat on the mat or floor, hip distance apart. Place your hands (lightly) on either side of your head. I recommend your ears as a good landmark. It’s important not to grip or pull your head or neck. Next, it’s time to engage your core by making sure the small of your back is being pushed into the floor. Draw your belly button into your spine, tightening the abdominal muscles. Begin to roll your shoulders off the floor towards your knees. While doing this, check that you have a few inches of space between your chest and chin and that while the shoulders lift, your back stays flat on the mat or floor. Hold for a moment (or two) at the top, and then slowly come back down. Finally, remember to breathe throughout the exercise. In this exercise, you exhale on the way up and inhale on the way down (or at the bottom of the exercise). Think exhale as you exert. To start, lie on your back with your knees bent and feet flat on the floor with heels placed flat on the mat or floor. Place your hands on opposite shoulders (arms crossed across the chest) or behind or either side of your head. Note that it’s important not to grab or pull your head or neck. Begin to slowly and gently lift your head and then your shoulder blades off the floor or mat. Next, pull up from the floor (keeping your core engaged) until you are at a ninety-degree angle and your elbows are on or past your knees. Hold this position for a second or two, and then slowly lower your torso back to starting position. Always remember to check with your doctor before starting a new physical activity program. While exercise is recommended for almost everybody, there are certain conditions that can be worsened by specific types of exercise.